Entertaining is super easy with the Instant Pot. I was hosting a bunch of people and had prepared laksa which is a kind of curry noodle for them, then suddenly remembered that kid#2 was going to be at home for dinner as well and she NEVER ever eats spicy stuff. So although it seemed a little ridiculous to have 2 different noodle soup dishes available for dinner, that’s exactly what happened. Vietnamese chicken pho is even easier to make than beef pho – there is less different cuts of meat that goes into the stock. For this prep, however, I decided to do something slightly different, which is to add chicken feet into the stock. 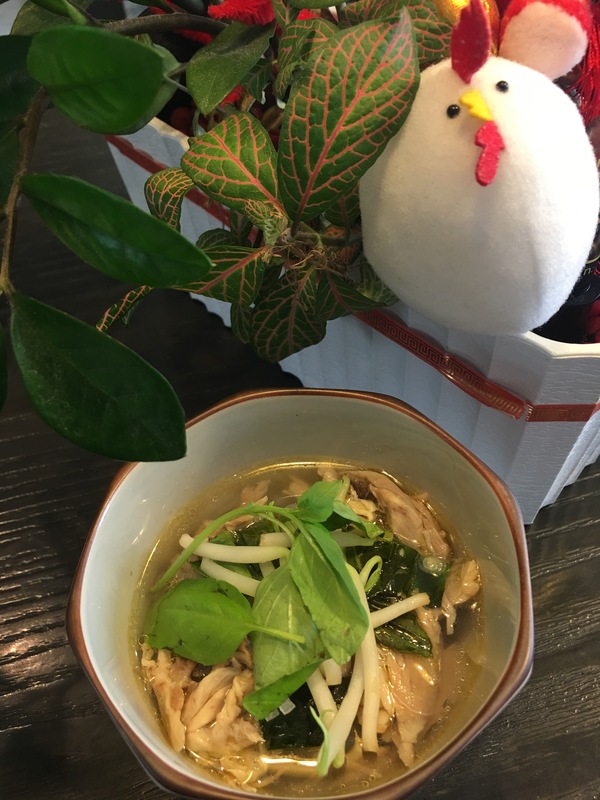 In Asia, chicken collagen soup is all the rage – it’s supposed to be really good for the skin, which is why there are restaurants serving chicken collagen hotpots as “beauty pots”. Regardless, this lends a kind of rich, silky and luxe flavours to the Chicken Pho, which is rather nice, I think. Refrigerating this stock in the fridge would give a really nice jelly-like appearance because of the high collagen content. This pho was made low carb for myself by using a sugar substitute instead of rock sugar for the stock, and to use shirataki noodles instead of pho noodles. Of course for the rest of my guests, regular noodles worked out well. So anyway in the end it turned out that 2 of the people at dinner also didn’t like spicy food, so I’m happy that I made this chicken Pho in the end – at least 3 out of the 9 at dinner benefitted! It was satisfying, quick, and easy. Put the Instant Pot into Sauté mode, and heat up the oil. Sauté the spring onion, ginger and onion until caramelised. Add the chicken drumsticks and thighs and chicken feet. Add the water (it should come up to about the 4L mark in the pot). Add the star anise, cardamom, cloves, white peppercorns and salt. Put the pot into “Soup” mode (or 30 min manual pressure cooking mode on high). When done, do a quick pressure release. Remove the chicken thighs and drumsticks and shred the chicken. Set aside. Drain the rest of the stock, discarding the aromatics and chicken bones. Return the stock back to the pot. There should be about 3L stock, but you can add some additional liquid to come up to the mark. Add the fish sauce and sugar substitute and stir through the stock. Taste and adjust seasoning. Place noodles into a bowl and top with shredded chicken, bean sprouts, some thin slices of onion, and ladle soup over the noodles. Top this with some basil and coriander leaves and chili pepper if desired. Serve hot.